Last night during the ‘One World Boxing Festival’ at the National Sports Centre, Bermudian boxers displayed perseverance, power, and pride against their international opponents. Robert ‘King’ Somner fought against Victor Santos and won by a unanimous decision from the judges. “I felt like I did my job and what I aimed to do, I stuck to my game plan and I came out on top,” says Somner. During his match, Somner not only performed well boxing against his opponent but also entertained the crowd by displaying his Gombey pride. Somner uses this tactic to annoy his opponent. Another Bermudian boxer who displayed great power was Andre ’Showtime’ Lambe. Despite not knowing the name and not being able to search his opponent until the morning of the fight, Lambe won. Since last night, Lambe has won seven fights in a row, 7 [W] -3 [L]. “It was a new type of fight for me,” says Lambe. His opponent, Corey Moore from Baltimore is more experienced, having had more fights and more wins but Lambe was victorious. “This was a more strategic fight. It was a learning experience. I’m glad I came out with the win, I feel like with more fights like that I can improve a lot better than I am already,” says Lambe. Finally, Nikki Bascome displayed perseverance in his boxing match. 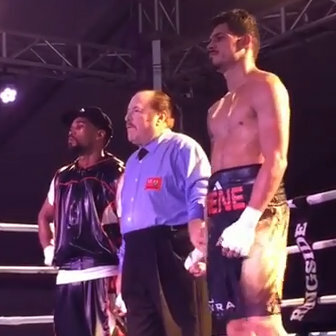 The professional Bermudian boxer fought against Mexican boxer David Gomez in the final match of the night. Both boxers were forceful and technical in their performances. During their fourth round, Bascome had the crowd on their feet while throwing jab after jab at Gomez. Gomez was fighting back, throwing powerful swings at Bascome. The match was intense and the win was close. The judges scored the fight 60-54, 59-55, 59-55 for Bascome. After a forceful match, Bascome remains undefeated with seven wins.